TOPEKA, KANSAS (April 11, 2019)—A new graphic novel from Koji Steven Sakai and John Mayer called Santa VS Zombies launched on Kickstarter on April 9, 2019. This sixty-page graphic novel follows a burned-out Santa Claus who reluctantly embarks on his last chimney crawl only to find his world turned upside down by a zombie apocalypse. With the help of a crew of children and a single mother, Santa rediscovers his Christmas spirit while saving the world. 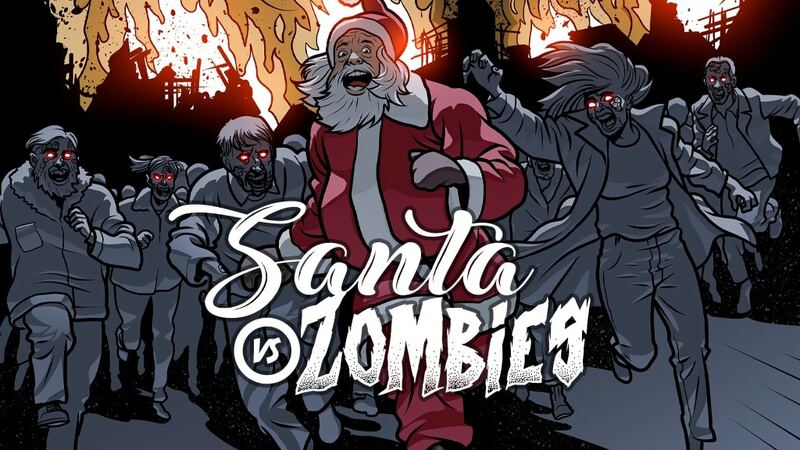 “Santa VS Zombies combines two of my favorite things…Santa and zombies,” explained co-creator Koji Steven Sakai. “If every day was a zombie Christmas I’d be happy.” Sakai’s love for zombies is evident in his prose fiction, including his debut novel Romeo & Juliet Vs. Zombies. Sakai is a comics veteran, and his graphic novel, 442, which follows an entirely Japanese-American regiment during World War II, was released in 2017. Meet Santa. He’s having a mid-life crisis. He hates his job and wishes he was doing anything else other than being Santa. He’s just going through the motions and that’s why he doesn’t notice the zombie apocalypse until it’s almost two late. Saved by two kids, he at first tries to get back to the North Pole only to discover that his reindeer have been eaten. On the run and just trying to survive, Santa befriends the kids and falls in love with their recently-divorced mother. Soon Santa rediscovers his Christmas spirit and does everything he can to save Christmas for the kids—even if it means his own death. Koji Steven Sakai is the founder of Little Nalu Pictures LLC and the CEO of CHOPSO (www.CHOPSO.com), the first Asian English streaming video service. He has written five feature films that have been produced, including the indie hit, The People I’ve Slept With. He also produced three feature films, a one-hour comedy special currently on Netflix, and Comedy InvAsian, a live and filmed series featuring the nation’s top Asian American comedians. Koji’s debut novel, Romeo & Juliet Vs. Zombies, was released in paperback in 2015 and in audiobook in 2016; his graphic novel, 442, came out in 2017. In addition, he is currently an adjunct professor in screenwriting at International Technological University in San Jose. John Mayer is a well-published author both in fiction and non-fiction with three previous novels, two screenplays and a performed stage play. With over twenty non-fiction books published. His latest, Family Fit: Find Your Balance in Life, which was published by Healthy Learning, one of the world’s foremost publishers of instructional materials for health/wellness, fitness, exercise, sports medicine, and camp professionals. Mayer’s day job as a clinical psychologist specializing in violent behavior has him consulting to law enforcement regularly. His 10,000 Twitter followers (@DrJohnMayer) (@jemayerbooks) look to his daily tweets for advice on psychological issues. He is an associate staff psychologist for Doctor on Demand (doctorondemand.com ) as well as a provider (Telemedicine) on DoctoronDemand. Mayer is also a writer for a cable TV series, The System, that is currently in production with the pilot episode completed.